Stop playing with that thing and go play outside. Sound familiar? If you’ve heard this from your parents, or if you’ve said this to your kids, you’re going to like this. Tony Hawk, the biggest thing that has ever happened to the skateboarding world, has done it again. 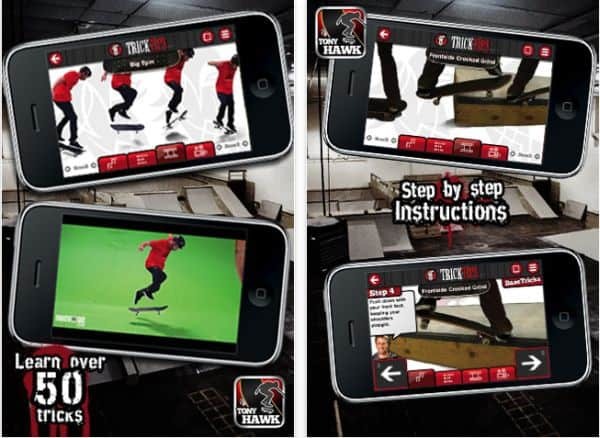 This Tony Hawk’s Trick Tips iPhone App, released by EpicTilt, is something quite unique. Rather than offering a video game that can be played on the iPhone, this goes much further. This app will actually teach you how to do the tricks yourself. And that’s not all it does. The Tony Hawk app for iPod touch and iPhone also offers scrolling news direct from the world of Tony Hawk. And you can watch SK8 videos from Shred or Die directly through the app. What kind of Skateboarding tricks can you learn? You can start out with some basic tricks for flat ground, including ollies (frontside, backside and regular), a half cab, kickflip, healflip and a whole bunch more. When you’re ready to move onto some more advanced stuff you can learn the half cab kickflip, big spin flip or the Ollie Impossible. But he doesn’t only teach you the flat ground Skateboarding tricks. There are also some basic ledge/rail tricks like a backside 50-50 and a front- or backside noseslide. And of course there are some more advanced ledge/rail tricks included too. Each Skateboarding trick is broken down into steps and taught by Tony Hawk himself. The lessons include still photos of each step and videos to help you really understand how to do the tricks. You’re not going to find a better way to incorporate the extreme coolness of Tony Hawk with the awesomeness of the iPhone. Just remember to have your friend hold on to your iPhone for you while you practice what you just learned so you don’t break anything. OK, at least you won’t break your phone. You can get Tony Hawk’s Trick Tips at the iStore for insanely low price of only $0.99. Get this Great Sports iPhone App Here!